This is an article that has been sent in to us by one of our Premier Dealers, Carbon-Monkey. Carbon-Monkey is a mountain biking skills coaching and guiding company that is based in North Wales, and operates across the UK. 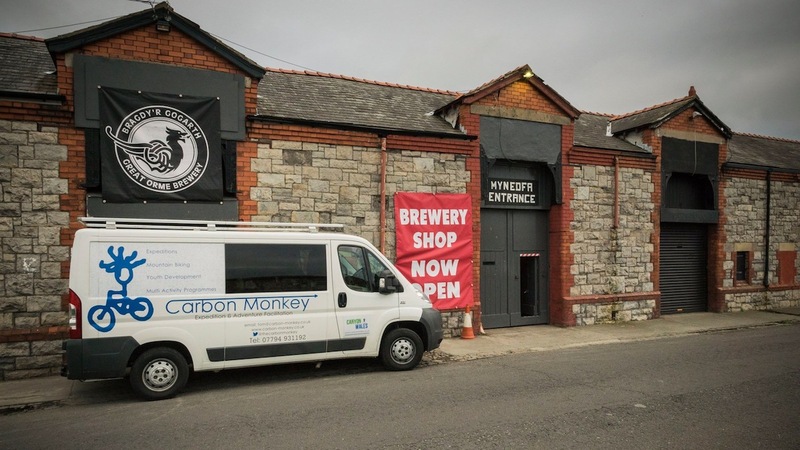 Tom Jonstone of Carbon-Monkey recently got involved in a social enterprise after being approached by the Great Orme Brewery in North Wales to run a ‘Bikes and Beers’ type workshop. 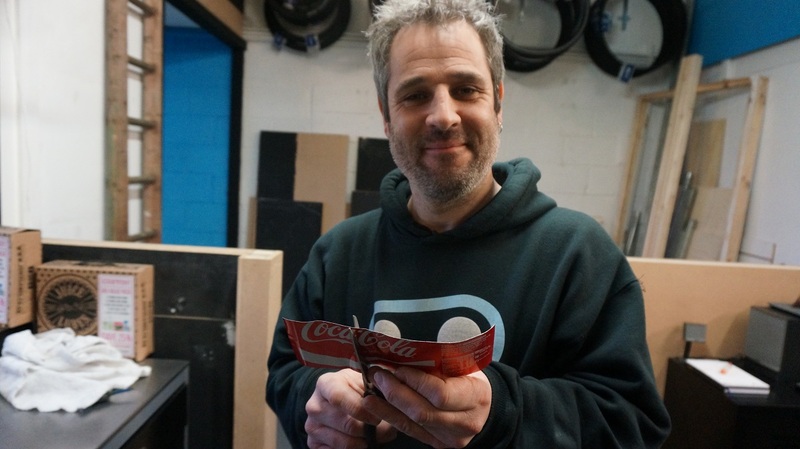 The idea is to provide a social environment for bike riders to learn more about maintaining and repairing their own bikes. Oh, and did we mention it’s in a brewery?? Bikes & Beers: Seems like a natural combination right? 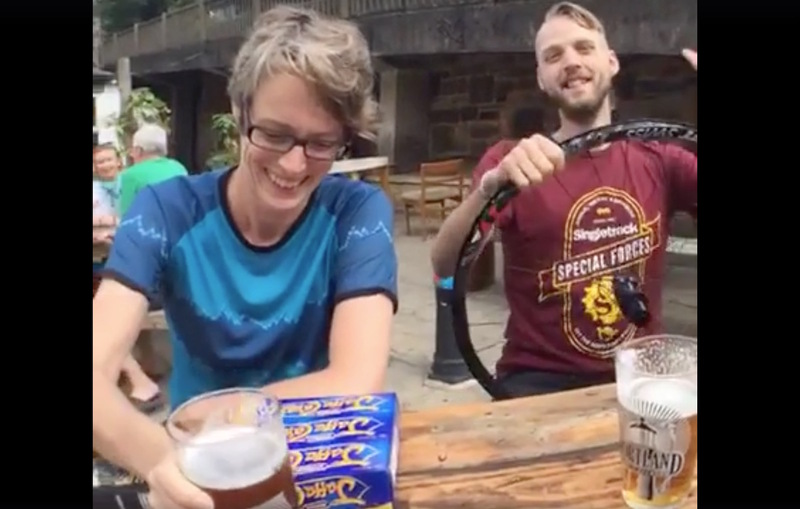 It’s pretty rare to find a cyclist who doesn’t love bikes, and beer. On the rare occasion I meet a T-total cyclist, they usually appreciate a good coffee too (Ed; that’s what we refer to as “The Holy Trinity”). 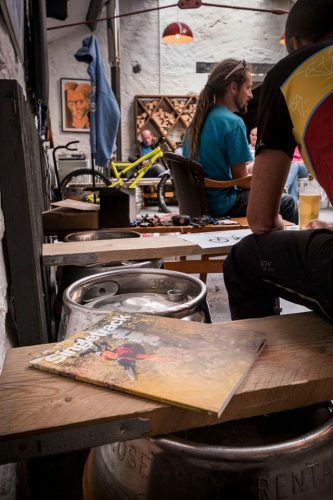 So when I wandered into the Great Orme Brewery shop in Wales two months ago and saw a poster on the wall announcing their upcoming ‘Bikes & Beer’ night, it was quite apt that I was conveniently offered an excellent cup of proper coffee during a half hour long chat with Gav Mart. Gav is the man behind the award winning @3rdspacewales; a social enterprise that shares space inside the Great Orme Brewery building. 3rd Space is located inside the Great Orme Brewer in North Wales. Gav is a keen cyclist and a North Wales local. Like me he was lucky to grow up on the edge of the Snowdonia National Park and as an adult has come to love the place we live and spends as much time as possible out exploring it. Like me, he believes in the value of community, having great spaces and sharing skills and knowledge, he understands the true value of ‘Corporate Social Responsibility’ and helps businesses figure out how to serve their community’s interests authentically. So, when he asked me to get involved and help run the Bikes & Beer evenings, I jumped at the chance. Every workshop should have a bar leading into it! 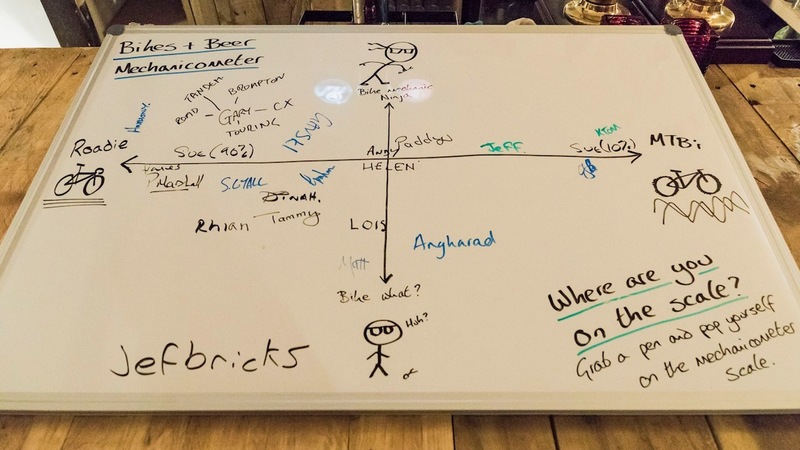 Where do you sit on the bicyclist matrix board? Roll forward a couple of months and that initial chat about bikes, beer and good coffee has developed into plans that include a social enterprise, a bike workshop, a series of social and educational evenings and a few great rides thrown into the mix. The format is simple. 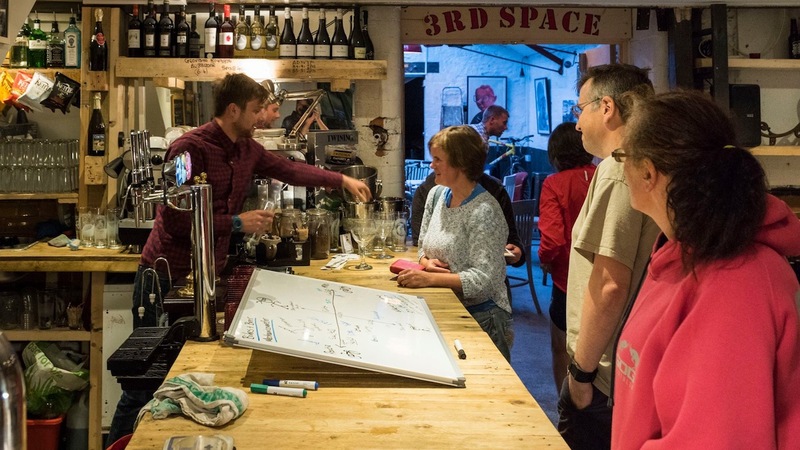 Once a month, 3rd Space is opened up on a Thursday evening for food, beer, coffee and an evening of bike related socialising. Tom Johnstone of Carbon Monkey chatting bikes before heading into the 3rd Space workshop. 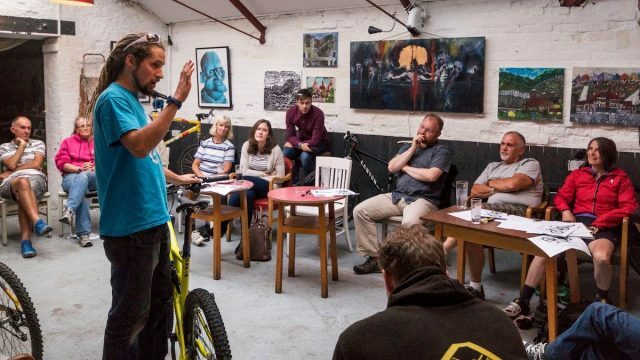 Each month we run a workshop on bike mechanics, starting with introductory level mechanics to help folk keep their bike rolling. Think fixing punctures, setting up brakes and tuning gears. Then we move onto more advanced discipline specific mechanics, such as suspension setup, converting to tubeless etc. 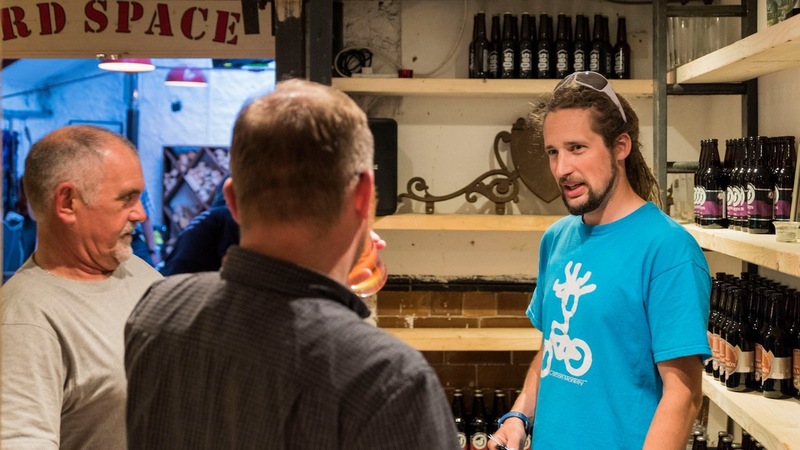 Tom covered off multiple topics during the Bikes & Beers introductory session. 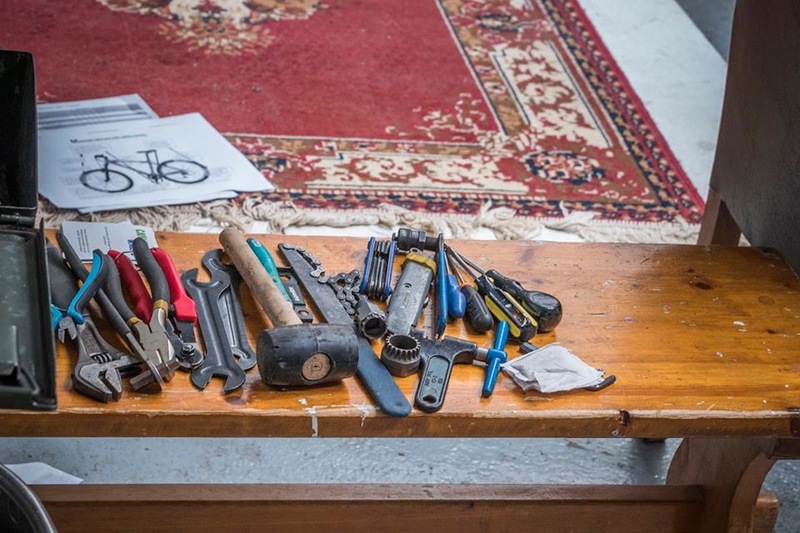 Once the workshops are done, we have time for people to get their own bike looked at and grow their experience and knowledge organically from those around them. 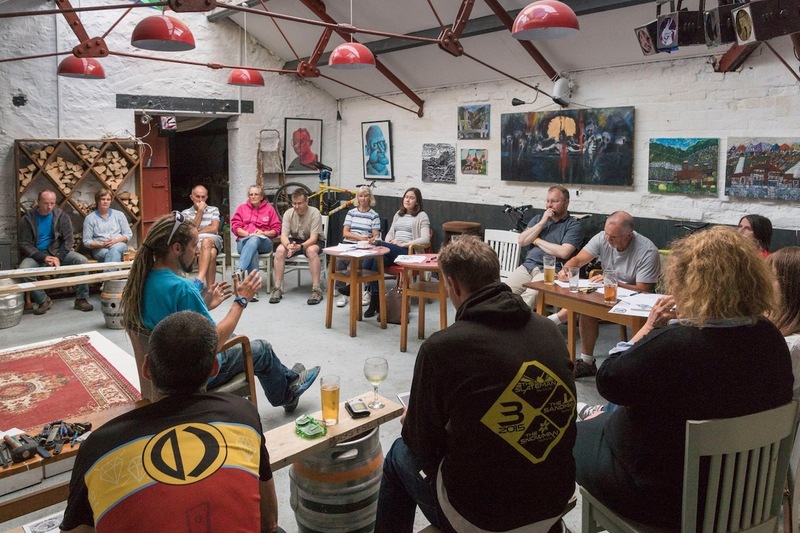 Our first evening saw cyclists from across North Wales gather together and have a great evening that involved sharing ideas, anecdotes and plans for the summer ahead. We had roadies and fatbikers, lifelong hardened cyclists and those who occasionally take a gentle spin along the promenade. It was a real mix of bike riders. That’s a bottom bracket, that is. The theme for our first workshop was ‘Giving your bike a health check and fault finding’. Everyone who took part in our first workshop felt comfortable asking questions, as well as sharing ideas and potential solutions. 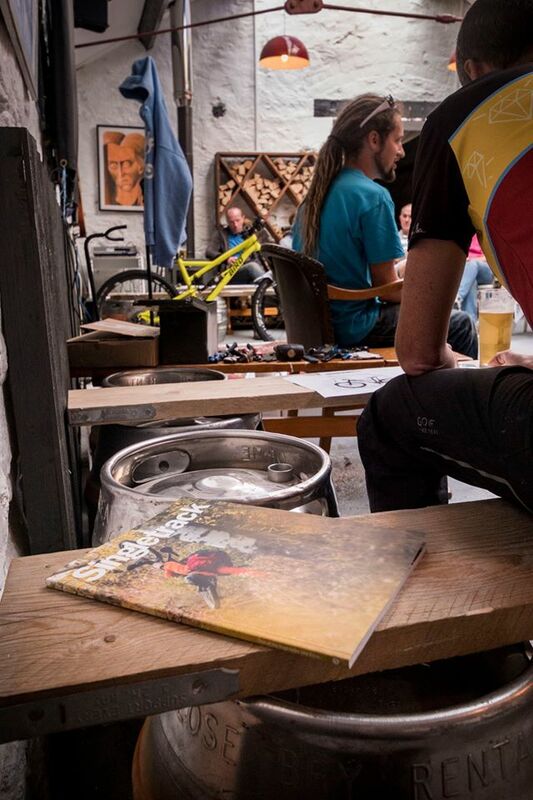 We then sat and shared ideas about where we as a community want Bikes & Beers to go. 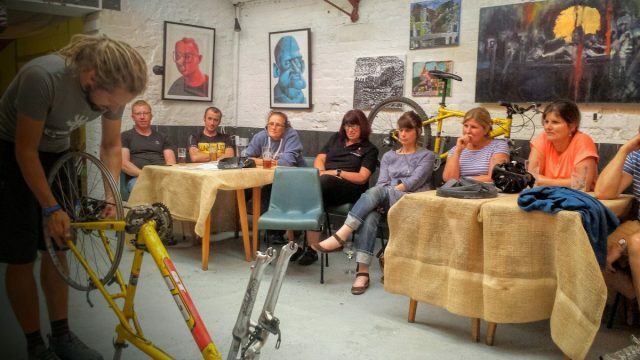 Next month we’ll meet and run another introductory-type workshop on fixing punctures and changing tyres, then we’ll move onto an advanced class looking at going tubeless and setting up suspension. With the goal of empowering bike riders with the necessary knowledge required to maintain and repair their own bikes, the Bikes & Beers workshop is still in its infancy, but is already growing momentum. 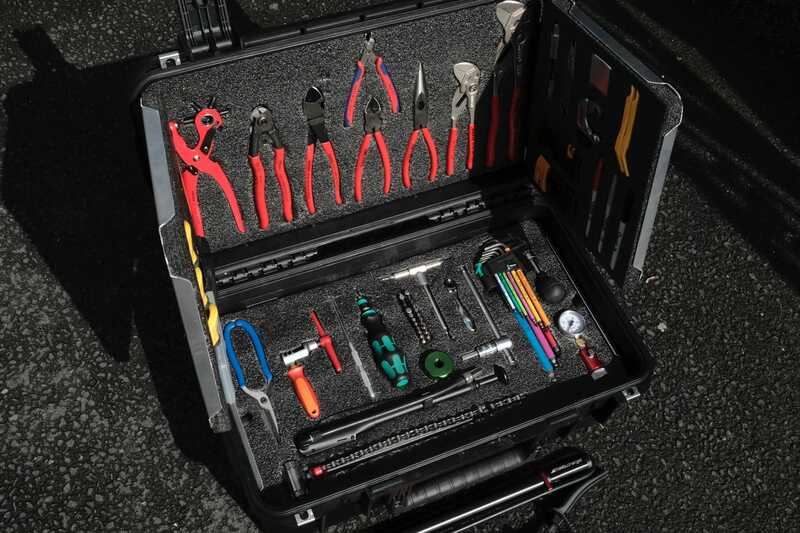 Going forward we are looking to get a workstand and a full set of tools so that people can drop in and service their own bike while getting helpful hints from other cyclists (inspired in part by the superb ‘Velocity’ in Inverness). We have a fleet of old MTB’s that we’re going to fix up and have available for individuals or groups to hire at a discounted rate to encourage more folk to give cycling a go. Well-worn tools: the sign of many years experience. We have plans to get local cyclists and adventurers to come and do talks and slideshows, and hope to be able to show great cycling films. All this in a room off the back of a brewery; a brewery that also serves great coffee and has a kitchen serving superb pizza’s and burgers. 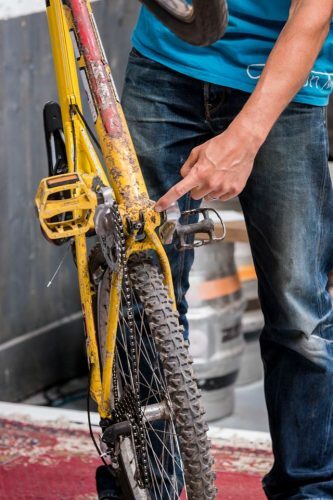 It almost sounds too good to be true, but it’s happening, and we welcome all cyclists regardless of when your bike last came out of the shed, how fat it’s tyres are, and even whether you drink beer or not. @3rdspacewales is a social enterprise running a superb bar, the recent birthplace of the all-new ‘Gorjys Events’ and street food joint alongside the Great Orme Brewery in Llandudno, North Wales. Carbon-Monkey is a MTB skills coaching and guiding company that operate across the UK from their North Wales base. These organisations are working together with local cyclists to launch Bikes & Beers (social enterprise) for the good of the cycling community and welcome any help, support, advice or donations. We need to build a workshop and get the spare parts to get our fleet back on the road again and would welcome donations or offers of sponsorship. See https://www.facebook.com/BikesBeersNW/ or contact tom@carbon-monkey.co.uk.